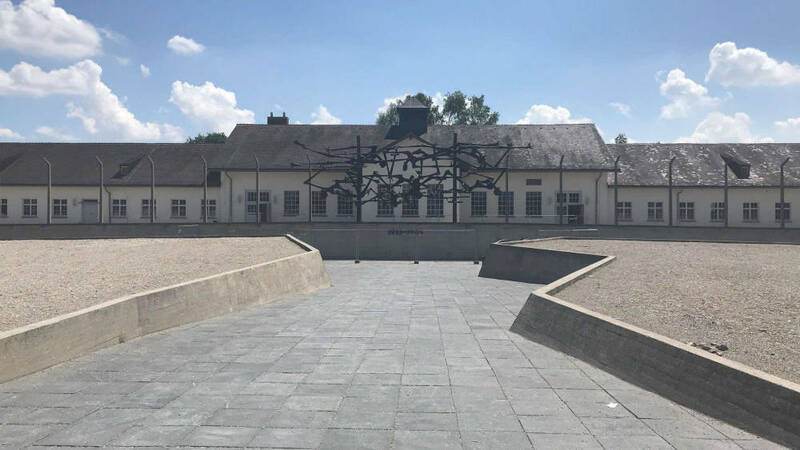 When Adam and I started planning out the locations we might like to visit during our trip abroad it occurred to me that I would find it insightful to visit Auschwitz Memorial site if possible. I took a History of the Holocaust class during my undergraduate studies and since then have been interested in taking a tour. The trip out to Auschwitz ended up being more time consuming than would fit into our travel schedule. However, if we visited Munich, Germany taking a tour of the Dachau Memorial site would be within reach. So, after a few wonderful days in Amsterdam Adam and I boarded a train to Munich. 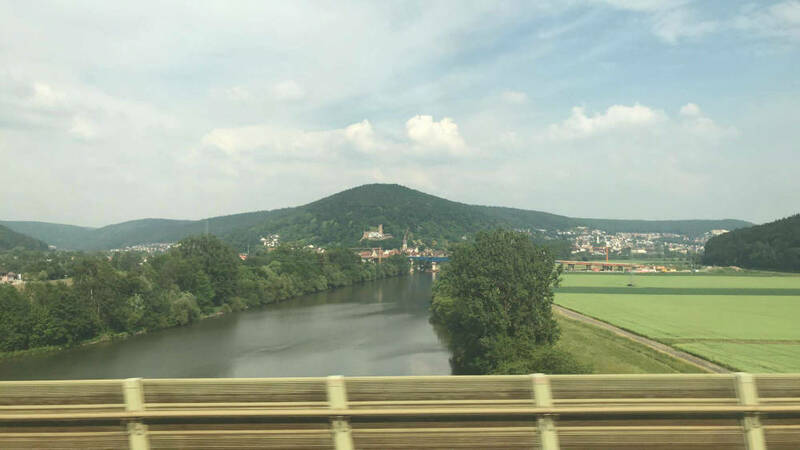 View during the train journey. We didn’t see or do much while in Munich; quite frankly we were there just because I wanted to take a tour of the former concentration camp. During the History of the Holocaust class I took in undergrad I was thoroughly exposed to the horrors of the Holocaust. I watched many documentaries with footage taken during camp liberations, and cried through many hard-to-read survivor stories. If you’re interested in reading survivor stories I would highly recommend starting with Night by Eli Wiesel. The day before we were to go on the Dachau tour Adam asked me if I felt ready. I said yes and I meant it. Whenever we go on trips my favorite parts always include learning about the history of a place; whether it’s good or bad it’s always worth knowing. Now, having been to the memorial site I can say I was not ready, and that I don’t think that there is a way to be ready for what you experience during your visit. Gates to the former concentration camp. Our guide for the tour was the best guide I could have asked for. He had a master’s degree in history (I wish I could remember in what exactly) and was very knowledgable about Dachau. We found out that in order to be a tour guide you have to taking a training course and pass an exam with someone who has a PhD that specializes in Holocaust studies. Before the tour started our guide let us know up front that there are really only two rules when it comes to picture taking: don’t smile in any of the pictures and don’t take selfies. If you must have a picture of something with yourself in it, please ask someone else to take the picture. He reminded us we were going to a former concentration camp, not Disney, and to be respectful. Because the laws are very strict with regards to Holocaust denial throughout Germany he also would not allow anyone to take pictures or videos of him. He said today it’s too easy for someone to edit a video clip to make it sound like a tour guide is giving poor information and that could easily get him fired and land him in jail. He was a very serious guide and I liked that because it felt fitting. He also explained it’s important to refer to Dachau as a “memorial site” or “former concentration camp” as it ceased to be a concentration camp the day it was liberated. Pictured here is the current museum and former intake building for prisoners. The guide also told us that we would only see parts of the former camp that contained prisoners. It was determined that the areas that the SS lived and worked would not be a part of guided tours because those areas were used purely for evil by evil people and there was nothing redeeming or worthy of learning by touring those areas. Finally the guide explained that back in the day the memorial site used to have chilling pictures all around the camp but that they had been removed. He told us this wasn’t to downplay the horrors that had occurred at Dachau, but rather because the site managers found that people were so distracted and distraught by the pictures that they then were not in the right mind to listen to the history lessons, and it was determined that learning and sharing the history was more important than the shock value of the images. You can still see haunting images and videos of liberation day within the museum. And thus the tour began. Walking up to the gates at Dachau gave me a lump in my throat. I had seen these gates, seen the layout beyond the gates, in so many documentaries and it looked exactly like it did in those films. Walking into the memorial site I was already getting choked up; several times throughout the day I would catch myself starting to cry. I can’t properly express to you the overwhelming mix of feelings that ran through me. The buildings seen here were the barracks where prisoners slept and bathed. The memorial site was created with direction from several surviving prisoners, and as such is an accurate representation of the former camp. It definitely looked like what I had seen in documentaries, in fact I think because it looked exactly like what I had seen in documentaries is what made it so chilling. I barely took any pictures during our visit mostly because there was hardly anything I wanted a picture of. I think pictures are important for preserving the memory of something, and remembering the Holocaust is extremely important. However, there are certain things that I felt I had no right to take pictures of, such as the gas chambers and crematoriums. Speaking of which, I knew during the tour we would see the bunks where prisoners slept and such, but I had no idea we would walk through the gas chambers or look into the crematoriums. I was completely unprepared for the experience of walking through a gas chamber and felt so overwhelmed that I had to immediately exit. I’ve never felt so shaken up. Statue of the unnamed prisoner. For the next few nights every time I closed my eyes I saw the gas chamber, and even now just writing this I’m tearing up. 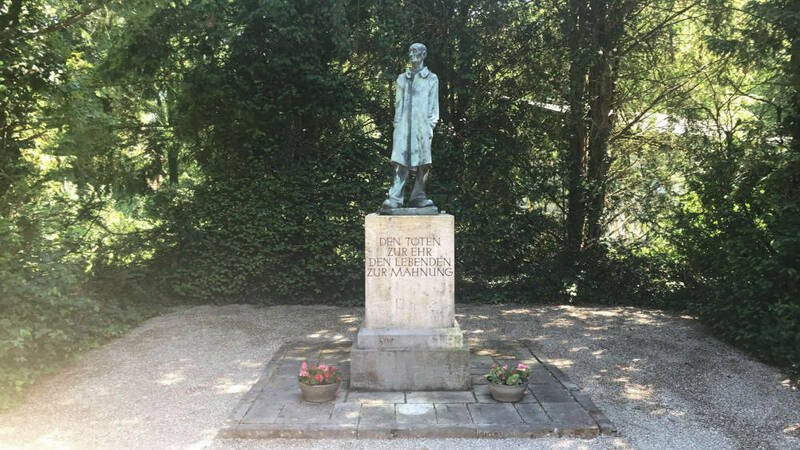 Throughout the tour our guide reminded us that Germany was an intelligent, modern country and that if the Holocaust could happen there it could repeat itself and happen anywhere. This is why we must not just remember the Holocaust but study it and understand the economic reasons why it happened. 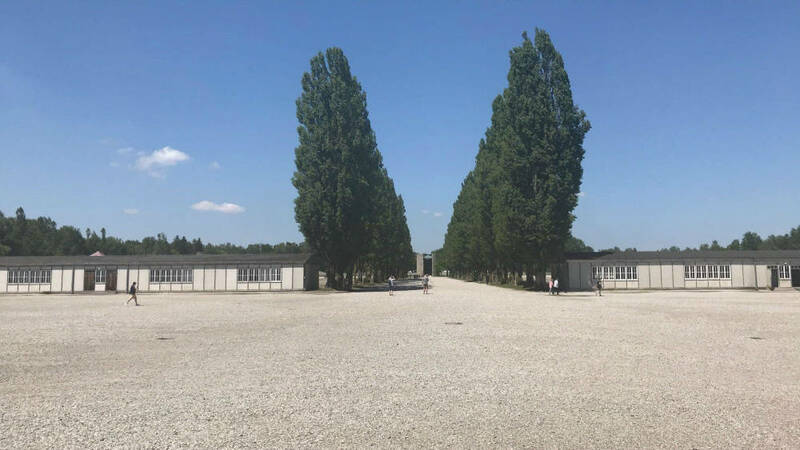 During the tour we walked through the sleeping quarters, the showering/bathroom areas, walked through the gas chambers, saw the crematoriums, looked up at the guard towers, saw the trenches and viewed the religious buildings now erected on the site in memorial. Our guide wrapped up the tour by telling us some truly horrifying methods of torture used on prisoners that were eventually banned at the camp because it gave the guards PTSD. I thought I had heard of most of the torture methods during my History of the Holocaust class but I had not. I can’t repeat the methods here, sorry, but I thought it was worth sharing that the torture was banned because the guards doling out the punishment couldn’t stand it anymore. How horrifying is that? Finally, the tour ended with watching a short video taken on the day the camp was liberated. At the end of our trip when Adam asked me what the most memorial part of the whole vacation was I told him it was walking through the gas chamber. He agreed that it’s the thing that sticks out most to him as well; it’s not something we’ll ever forget. If you ever have a chance to visit a former concentration or extermination camp I would encourage you to do so even though it will probably shake you to your core. Remembering the prisoners and understanding how the Holocaust came to be is important. For those wondering, the train from Amsterdam to Munich took about eight hours and cost $243.77 for two tickets. Adam and I took an early train and slept through much of the ride. We stayed at the the Relexa Hotel which I can highly recommend. It’s within 5 minutes walking distance of the Munich train station and about 10 minutes walking distance from the city center where there are plenty of shops and restaurants to explore. The room was standard, comfortable and inexpensive at just $224.5o for two nights. 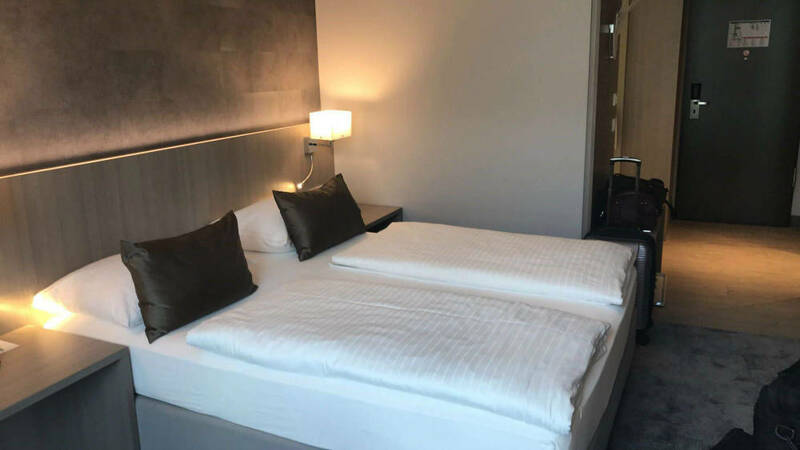 Adam had warned me that in Germany hotels don’t have a single comforter but rather individual comforters for each person which was kind of odd. I’m used to snuggling up next to him but felt separated by our two blankets. The day after visiting the Dachau Memorial site we took a bus to the Munich airport and flew back to London for a few more days. More on that later this week. 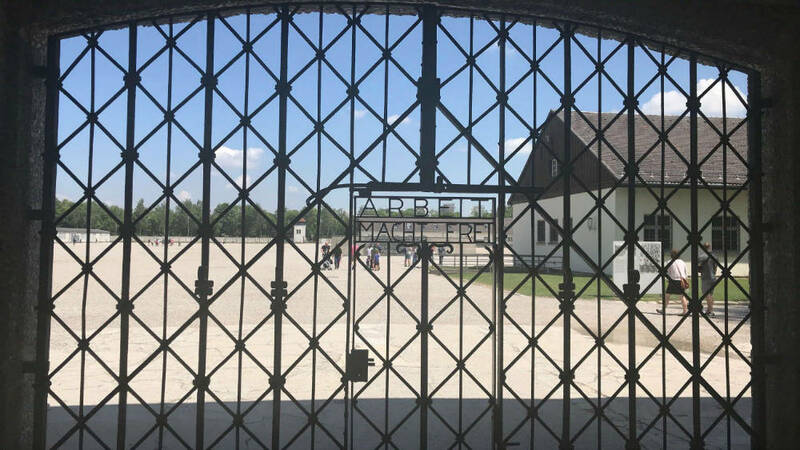 Please let me know if you have any questions about visiting Dachau, or if you have been and think I’ve left out anything important. Thank you! Previous Post Flying First Class Internationally Was a Dream Come True! Next Post May Running Check-In! Visting some of the camps is on my bucket-list. I know it’s going to be one of the hardest things I’ll ever do, but it’s important to me to see in person how my people were targeted and treated. Even though I have continued to work with our local Holocaust museum and survivors and do ongoing research yearly for our Holocaust unit at school, I know nothing will compare to seeing the camps, and I know there is always more to learn. I found the rules for photos interesting. One of the major issues with camps located in Poland is the disrespect. Kids go there to drink, they graffiti the memorials, they take ridiculous selfies, etc. I think camps located in Germany have stricter rules and more respect because Germany is determined to learn from its mistakes, whereas Poland still has rampant anti-Semitism and Holocaust-involvement denial issues. I truly cannot imagine how emotional of an experience this would be for you, but I can definitely understand your desire to do it. Even though the gas chamber and cremation ovens haven’t been used for decades, seeing them in-person made feel much more differently than having seen them in video or in books. I know people say this all the time, but the Holocaust wasn’t that long ago, and seeing the camp in person made me realize just how true that is. The bunks look like bunks I slept at when I was a kid at summer camp The toilets could be any toilet today. This didn’t happen in ancient times when people were less educated, it happened when our grandparents were young adults. Of course I knew all that but it felt so jolting to see all of the buildings and items in person. Wow! It sounds like a very moving experience, and a heartbreaking one. I have read that Germany takes teaching the Holocaust very seriously, and they are very ashamed of it, and teach it as such. Night is an amazing book! I have been reading a lot of historical fiction about the Holocaust, it’s all heartbreaking. I can understand the strong feelings, I remember feeling this way when we visited the 9/ 11 Memorial and the flight 93 Memorial. Thank you for sharing your experience! Hey Ana, if you’re reading books about the Holocaust I would recommend Maus by Art Spiegelman. It’s a graphic novel, which I thought was weird when my professor first assigned the book to us in class, but once I started reading it I forgot that it was a graphic novel. It’s also something that you could possibly share with your son now or in the future. Being in graphic novel format I think makes younger people more interested in reading it. Hearing about the torture, as if just being a prisoner there wasn’t torture enough, was very difficult. During one particular mention I had to stop listening and just focus intently on the floor until I saw the group start moving. I visited Europe with my family summer of 2000. Like you, my mother wanted to visit Auschwitz Memorial, but timing would not allow….and we went to Dachau. I remember it feeling so….”weird”. Weather happened to be kind of overcast (so gloomy-ish)….and it happened to be July 4th. It was kind of an eerie feeling to be on the grounds of a former concentration camp, while the date was celebrating my home country’s independence. Seeing your pictures makes me remember that day even more.